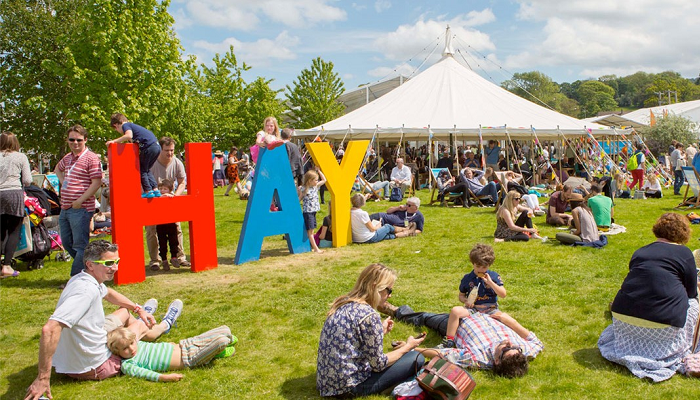 Hay Festival is launching a professional development opportunity for Welsh writers, in partnership with Literature Wales, funded by Arts Council of Wales. This opportunity for professional development for Welsh writers will take place during the Hay Festival, which runs from Thursday 24th May to Sunday 3rd June 2018. The fully programmed week will allow selected writers to attend masterclasses, workshops, and to network with UK and international writers, publishers, press and agents. The unique gathering of the publishing industry that takes place at Hay will enable selected writers to create new work, increase confidence, skills, and to form peer group support. We also expect new networks to be created that can aid Welsh writers in navigating the changing ways the publishing industry works in a digital age. There is no age restriction. 20 places are available – with bursaries for accommodation, travel from within Wales and subsistence on site. The festival site is fully accessible for wheelchair users and performance venues are fitted with induction loops. Guide dogs are permitted. Hay Festival invites applications from poets, fiction (all genres) and non-fiction writers in English and Welsh. Eligible applicants are Welsh writers (born, schooled, or currently living in Wales) who show a clear commitment to professional development via evidence of publication. A writer’s biography – including professional experience, publication/s and publishers (no more than 200 words). A statement outlining your commitment to professional development as a Welsh writer and how a place on the Writers at Work scheme will enhance this (no more than 200 words). A short outline of your current project or work in progress (no more than 200 words). Your application should not exceed two double spaced sides. Applications delivered by post and late applications will not be considered. The aim of the week is to broaden creativity, output, peer group support and publishing contacts; therefore selected writers will be expected to be resident in/close to Hay for the entire festival from Thursday 24th May to Sunday 3rd June 2018. Most workshops begin at 10.00am each day. There will be at least one further meeting during 2018 that participants must be able to attend. Each writer will be expected to complete a full and detailed evaluation of the week and to write for Hay Festival’s International blog during the festival week.